As the water from the rapidly melting snow streams off the roof into the growing puddles below, it's a perfect time to reflect back on our week in Mexico and extract my top ten memories while they are fresh. The earnestness of the people. They work hard for little pay with joy in their hearts. Getting to know our Sandos Hotels & Resorts friend, Erdem. Originally from Turkey, he made his fortune in America before getting sacked by the recession. 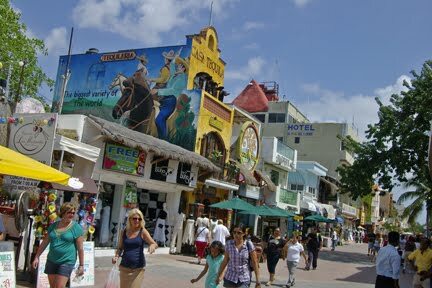 He now lives in Playa del Carmen with his family and loves it. A great sales rep who is a shining example of what excellent customer service is all about. Playing in the waves. There is nothing like it. Watching Dylan and Ben be brothers, creating their own world of play, on the beach or in the water. Experiencing the grand finale show at Xcaret. Not to be missed. Favourite moment: when the Spanish mandolin player began making beautiful music with the Mayan flute player. Delighting in freshly made guacomole. Yummy! Hot temperatures during the day and fantastic air conditioning at night in Casa Mah. If you are looking for a place to hang your heads in Playa del Carmen, we give Casa Mah our highest recommendation. Siestas with Heather. I love a country where napping is encouraged. The certainty that we will return to swim with the dolphins, play with the monkeys and experience more of what the Mayan Riviera has to offer. We began planning our Mexican adventure by asking for advice from our Facebook compadres. Playa del Carmen rose to the top as the destination of choice. After a full week in paradise, we now understand why.